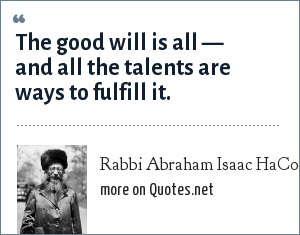 Rabbi Abraham Isaac HaCohen Kook: The good will is all — and all the talents are ways to fulfill it. Abraham Isaac Kook (7 September 1865 – 1 September 1935) was an Orthodox rabbi, the first Ashkenazi chief rabbi of British Mandatory Palestine, the founder of Yeshiva Mercaz HaRav Kook (The Central Universal Yeshiva), a Jewish thinker, Halakhist, Kabbalist, and a renowned Torah scholar. He is known in Hebrew as הרב אברהם יצחק הכהן קוק‬ HaRav Avraham Yitzchak HaCohen Kook, and by the acronym הראיה‬ (HaRaAYaH), or simply as HaRav. He was one of the most celebrated and influential rabbis of the 20th century. "Rabbi Abraham Isaac HaCohen Kook Quotes." Quotes.net. STANDS4 LLC, 2019. Web. 18 Apr. 2019. <https://www.quotes.net/quote/72013>.